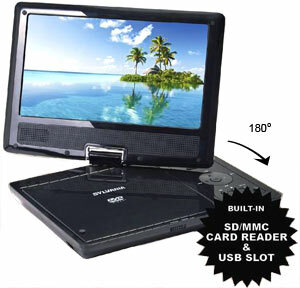 The Sylvania SDVD9000B2 9" Portable DVD Player makes it easy to enjoy your favorite DVD movies on the go. The progressive scan DVD player is compatible with a wide range of disc formats, and movies come to life on the 9-inch widescreen swiveling display with a 16:9 aspect ratio. There is a stereo audio output for the included earphones, that works with any standard 3.5mm headphones, as well as built-in dual speakers. An AV output lets you connect the player to a larger external display. 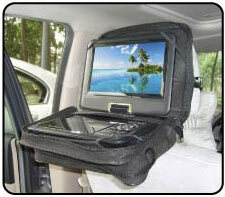 An AC adapter, DC car adapter, remote control, and carrying bag are included. This portable player offers a vivid 9-inch, TFT color display to watch your DVD collection on. The 16:9 aspect ratio allows you to watch your favorite movies without letterboxing (the black bars at the top and bottom of the screen) or zooming to fit the screen, cutting off part of the shot. The screen swivels 360 degrees for easy visibility.